Many Society Members availed themselves of the opportunity to participate in the series of collection trips to North Queensland organised by the Australian Tropical Herbarium (ATH) for the project Saving the unique plants of Australia’s tropical mountaintops by understanding their threats. In all, 15 discrete expeditions were organised by ATH culminating in the recollection of R. viriosum and R. lochiae from nearly all known mountaintops. 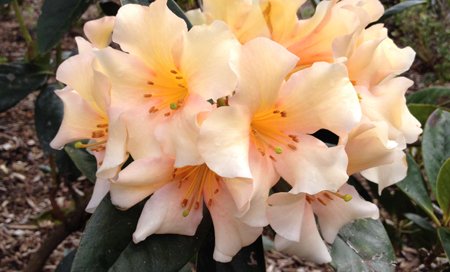 Funded by the Ian Potter Foundation, the Victorian Branch of the Australian Rhododendron Society and Simon and Marcia Begg, the project has been a huge success and provided a memorable experience for those Society members who participated in trips. Along with 10 other Society members, I was fortunate enough to participate in the trip organised in August last year where we visited Bell Peak North, Mt Lewis, Mt Spurgeon and the Windsor Tableland. The project and the expeditions were superbly organised by Professor Darren Crayn and Stuart Worboys of the Australian Tropical Herbarium, and on behalf of the Society, I would like to extend my thanks to Darren and Stuart for the opportunity to collaborate with them and for providing a truly memorable experience. Stuart Worboys has provided an article in this issue on the project and its findings, and Henry Hancock and I an article on our experience in participating on the trip to Mt Finnigan.